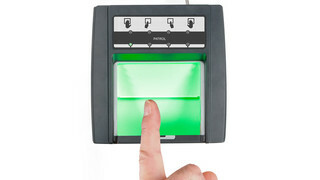 Ideally suited for in-field operations, the compact SEEK Avenger is the only fully certified biometric enrollment and credential reading solution purpose built to perform in the harsh and challenging environments of the military, border security, and law enforcement. Combining forensic-quality fingerprint, stand-off dual iris capture, high resolution facial and evidence imaging, and multiple format credential reading, the SEEK Avenger delivers a lighter, smarter, and faster solution than what is available in the market today. As the first mobile device of its kind capable of fingerprint and dual stand-off iris capture in direct sunlight, the SEEK Avenger provides mission flexibility by limiting operating constraints. Optional 3G/4G wireless connectivity and an onboard watchlist of up to 250,000 records, eliminates the need to transport unknown subjects in uncertain conditions for enrollment or identification; further reducing operational risk. With the addition of the optional MRZ and RFID readers, the functionality of the Avenger expands to include the reading and verification of ePassports and other noncontact credentials. These capabilities prove extremely valuable in highly remote locations, conditions where connectivity has been compromised, or when virtually instantaneous confirmation is required. 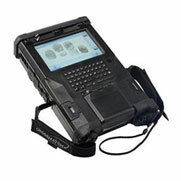 The Crossmatch® L Scan palm scanner line addresses the need for compact, high resolution, rapid capture livescan systems for criminal identification, forensic analysis and enrollment. L Scan palm scanners are fully compliant with the FBI NGI standards and easily acquire upper, lower and writer’s palms, flats and rolls. Incorporating proprietary FlexFlat and FlexRoll features, fingerprint images are captured regardless of positioning on the platen. Patented Auto Capture functionality ensures rapid capture of high quality images for error-free biometric data collection — eliminating the guesswork and range of possible reprint issues. Available in 500 ppi or 1000 ppi resolution, both L Scan models deliver superior image quality and offer real-time image preview when using our SDK or enrollment software. The scanners are designed for ease of use and provide an intuitive, integrated display and programmable buttons to easily guide users through the biometric capture process. The Crossmatch® Patrol ID livescan delivers the highest quality ten-print image capture for all your civil Identification Flats applications. FBI Appendix F certified, Patrol ID users can quickly capture fingerprint data for background checks and enrollment applications with confidence. With Patrol ID, it is easier than ever to identify “persons of interest”, maintain regulatory compliance or note unqualified employment applicants.